Warm and breezy conditions will continue before a cold front bring rain and a few strong thunderstorms to the area into Thursday. Some changes you will like are expected for Easter Weekend. Today and Tonight: Another mostly cloudy day is ahead with high temperatures climbing back into the mid 80s. Like Monday, some cracks in the cloud deck may allow for some times of sun and there is just enough moisture that an isolated shower is possible. Winds will be out of the southeast at 5-10mph. Tonight will be mainly cloudy and muggy with low temperatures in the mid 60s. Up Next: Wednesday will be breezy, warm and muggy again before a slow moving cold front arrives late. This system will bring showers and thunderstorms Wednesday night and Thursday. The Storm Prediction Center has posted a 2 out of 5 “slight risk” for severe thunderstorms. While widespread strong storms are not expected, a few could produce damaging wind or a tornado. Since it is the spring severe weather season, review your plans and keep devices nearby that can provide watches and warnings. Action will kick through the area by Thursday afternoon and a secondary front will knock down temperatures and humidity into Friday, Very pleasant weather is on tap for Easter Weekend. Saturday and Sunday will feature clear skies, no humidity, highs in the mid 70s and lows in the low 50s. 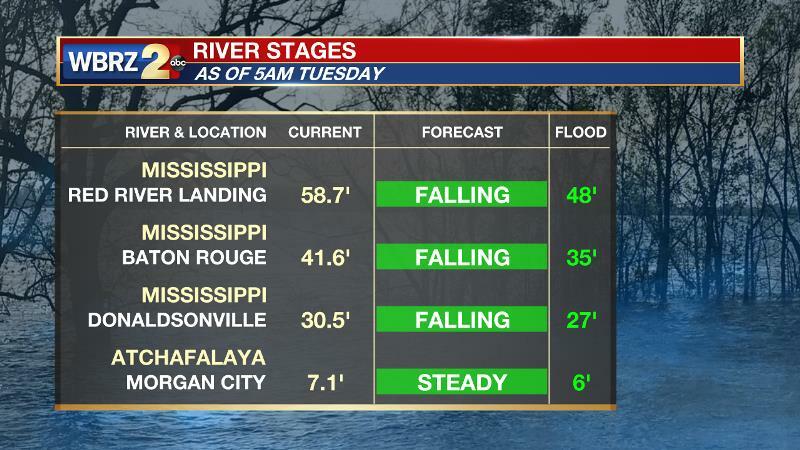 The Mississippi River is still falling. The water level remains high though and pressure on the levees could result in additional seepage and boils. Land may continue to be soggy around the Angola farms and by the LSU veterinary complex with ongoing river island inundation and industrial restrictions. Levees protect highly populated areas around the river, including Baton Rouge. In Morgan City, the Atchafalaya River has remained steady around 7 to 7.5 feet. Some water may make it into buildings at the foot of Ann Street and in Berwick on the river side of the flood walls. Backwater flooding could occur in Stephensville as well. A stalled front to the north and onshore flow may allow a spotty shower to develop over the next two days. An overall lack of forcing should mean very little is actually able to get going. 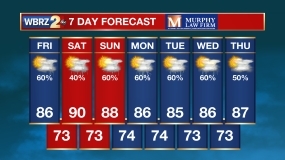 Due to a mid-level ridge and southerly surface winds, temperatures will warm above average into the low to mid 80s each afternoon through Wednesday. The pattern will begin to change on Wednesday as a slow moving trough and associated cold front at the surface approach the area. Wind shear will be sufficient to support stronger thunderstorms but instability could be questionable, especially with a mainly nocturnal event. For locations that get in on the action earliest, the northwestern half of the WBRZ Weather Forecast Area, the Storm Prediction Center has outlined a 2 out of 5 “slight risk” for severe thunderstorms. Due to the elevated wind shear, damaging wind gusts and tornadoes are the two primary threats. 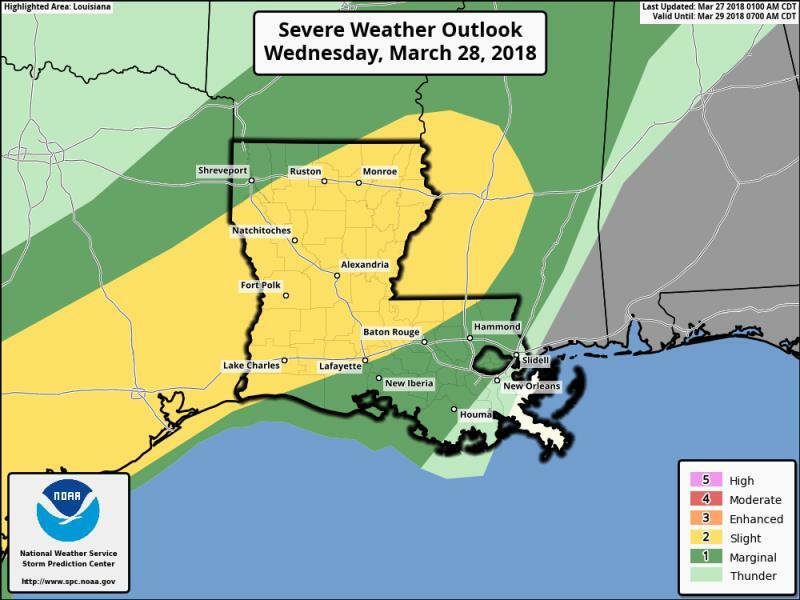 As the upper level trough deepens, a surface low pressure system may develop in the region which would only aggravate the low-level winds and further increase the tornado threat especially for southwest Mississippi and neighboring parishes in Louisiana. Most of the rain will occur along the boundary on Wednesday night and Thursday. The threat for heavy rain is there but a relative dry stretch should mean the area can handle a couple of inches. A secondary front associated with the trough axis will move across the region on Friday therefore holding some cloud cover in the forecast. However, cooler and drier air will advect into the region on Friday bringing very pleasant conditions for Easter Weekend.